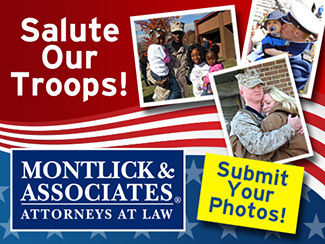 Montlick & Associates invites you to upload photos of your loved ones (active and/or Veterans) in uniform. 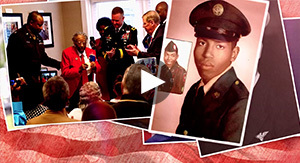 "Salute to the Troops" television messages and other tributes. You may upload up to 5 photos. After browsing for your first photo, another photo box will appear. If you wish to upload more photos, please do so. If not, please fill out the required fields below and submit your photo(s). Please submit the highest resolution photos you have available. I agree to your use of the photo and submitted materials as stated in your submission rules. Terms. By uploading your photo(s), you grant Montlick & Associates, Attorneys an irrevocable, non-exclusive royalty-free license to broadcast, display on its website, copy, edit and otherwise use your entry materials, including your photographs, for any promotional, programming or commercial purpose. Participants acknowledge and agree that Montlick & Associates, Attorneys shall have the right to edit, adapt, modify, reproduce, publish, promote, or otherwise display or use entries in any way it sees fit without limitation or compensation to entrants. 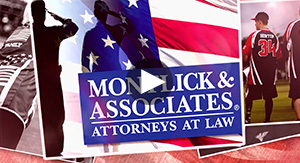 All submissions become the property of Montlick & Associates, Attorneys and none will be returned. Copyright. By uploading your photo(s), you agree to grant to Montlick & Associates, Attorneys an exclusive, royalty-free and irrevocable right and license to publish, print, display, edit or otherwise use the contestant’s submitted photos, in whole or in part, for any purpose and in any manner or media (including, without limitation, the Internet) throughout the world in perpetuity, and to license others to do so, all without limitation or compensation.